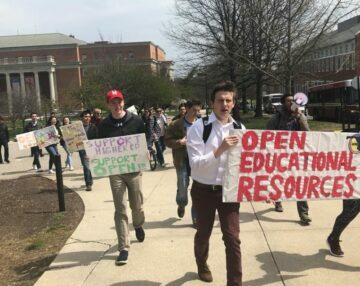 Washington, D.C. – Today, Environment America and the Student Public Interest Research Groups (PIRGs) launched a campaign to secure commitments from American colleges and universities to shift to 100 percent renewable energy. “With programs to slow climate change in trouble in Washington, other centers of national leadership need to step up. America’s colleges and universities are critically important in this regard,” said Gus Speth, Former Dean, Yale School of Forestry and Environmental Studies. Hundreds of colleges and universities already pledged to achieve carbon neutrality as signatories of the Climate Leadership Commitment. Universities that eliminate use of fossil fuels will play an important role in transitioning the nation to 100 percent renewable energy. The campaign launched as hundreds of college administrators, sustainability directors and clean energy experts met to collaborate on achieving their carbon emission reduction targets. A combination of environmental concerns and declining costs have made renewable energy the “go-to” option for many communities, businesses and institutions. Major corporations, including Google, General Motors and Walmart, have already committed to completely shift to renewable energy. Dozens of local governments, including San Diego, California, St. Petersburg, Florida and Georgetown, Texas, also have plans to go 100 percent renewable. 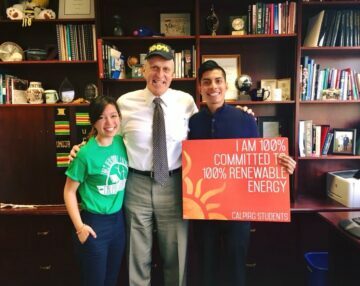 At the same time, the energy and enthusiasm of public-minded students at colleges and universities has played a role in most important social transformations, and will do so again as we shift to clean energy. 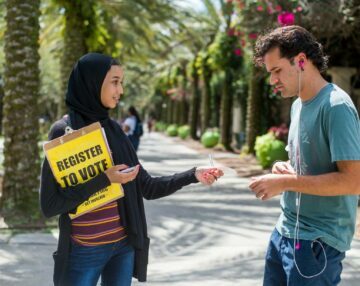 Find out how you can start organizing support for 100 percent renewable energy on your campus.